Here at Latitude 38, we love our own canine companions and understand how difficult it can be to leave them behind when we go on vacation. Fortunately for us, and for you and Fido, Telluride is arguably one of the most dog-friendly destinations you will find. If you plan on bringing your four legged friend along with you on vacation, there are tons of activities for you both to enjoy while visiting Telluride. Take a nice walk: A favorite among both locals and visitors, the River Trail offers an easy 3 mile walk along the San Miguel river. For those water dog types, the River Trail is the ideal location for your pooch to take a dip in our crystal clear mountain waters. Doggie pick-up stations are available all along the trail. Always remember to pick up after your pup to help keep Telluride dog-friendly! Take a hike: Have an active fur-kid? If you need to really wear out your active dog while enjoying our amazing mountain views, both of these trails are perfect for both of you. Bear Creek is 1.5 miles and starts at the end of South Pine Street. Jud Wiebe is a 3.6 mile loop that offers a bit more challenging terrain to wear your companion out, for a short nap at least. Hop on the Gondola: Yes, you can ride on the Gondola with your pooch between Telluride and Mountain Village! There are specific pet-friendly cabins on the Gondola. Just look for the sticker with the picture of a dog on the outside. This means the whole family can take advantage of this unique, free mode of transportation during your stay. Even better. Our Galloping Goose bus system also welcomes dogs! Enjoy an alfresco meal with your pooch: Many of our local dining establishments welcome your dog to join you on their patios. Smuggler’s Brewpub and Oak are two of our favorite Spot- friendly spots, where dogs are completely welcome to join you while you enjoy a meal on the patio. Just be sure to keep your pup leashed while you eat. Latitude 38 Vacation Rentals is excited to offer a variety of pet-friendly properties that welcome you and your furry family member. 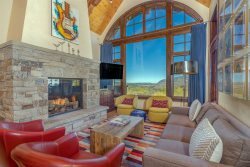 We would be happy to help arrange a fabulous Telluride vacation for your whole family, including your pooch. Give us a call at 970-728-8838 to find out more.